ShoeFitts Marketing shows retirement plan professionals how to clarify complex information and engage clients and prospects by tapping into the power of visual imagery with a new infographic. Professionals in the financial services marketplace should turn to more visuals, particularly infographics, when communicating complex material to their clients or prospects, according to Sheri Fitts, president of ShoeFitts Marketing. A visual perspective is especially useful, she notes, with social media posts on all platforms, not just the more photo-oriented sites. 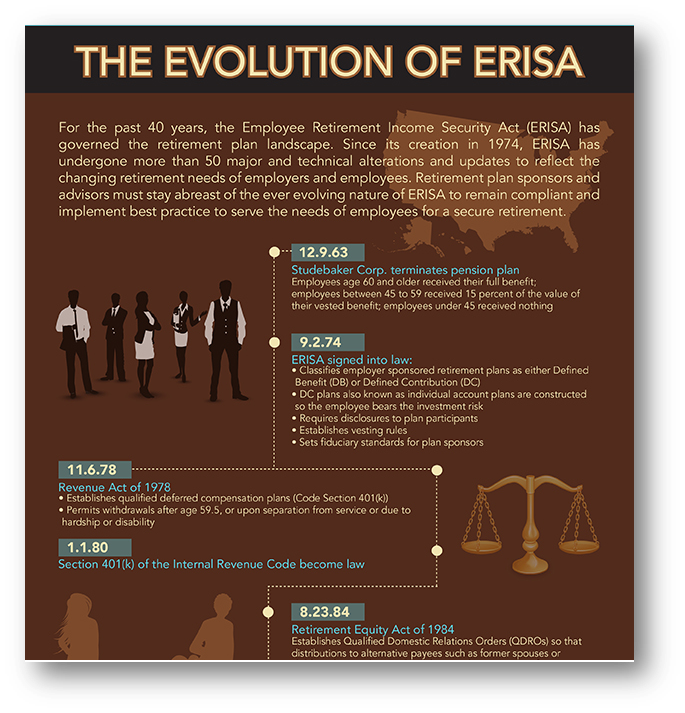 To illustrate the power of visual imagery, Fitts recently created an infographic to clarify the complicated history of defined contribution plans and the Employee Retirement Income Security Act of 1974 (ERISA). In the colorful illustration, Fitts shows a timeline with easy-to-follow text and corresponding illustrations to outline “The Evolution of ERISA”. Social media posts with text alone are often overlooked and ignored. Visual elements can grab attention and help communicate information. Fitts says the visual elements don’t have to be complex or costly. Photos, colorful graphics, and slideshows are good options, while infographics are the hot marketing tool. ShoeFitts Marketing helps clients be unforgettable. The Portland, Oregon-based company is a consulting organization at heart, drawing on decades of experience in the financial services marketplace to identify, create, and implement inspired marketing and social media strategies and solutions for its clients. ShoeFitts collaborates with people who recognize the need to differentiate in the vastly commoditized landscape of the financial services marketplace−focusing on Financial Service Organizations, Retirement Plan Advisors, and Third Party Administrators. The “100 Tips for Social Media Success” by ShoeFitts Marketing president Sheri Fitts brings a comprehensive social media game plan to professionals in the financial services marketplace with easy-to-follow instructions in an engaging and colorful format. Renowned social media expert and ShoeFitts Marketing president Sheri Fitts has released a comprehensive eBook designed to help the financial services industry understand and harness the power of social media. In “100 Tips for Social Media Success” Fitts speaks to both beginners and novice social media users with insightful advise and recommendations. While professionals in the financial services marketplace increasingly understand the importance of social media, Fitts says many of them still see the activity as a unique, occasional communication tool. Fitts keeps the social aspect at the forefront with her eBook by utilizing conversational and easy-to-follow tips with catchy images and a colorful layout. “100 Tips for Social Media Success” starts with the basics, such as creating a Facebook timeline, determining the best platforms to use, and developing the appropriate voice and content that aligns with a financial service professional’s brand or identity. More advanced tips cover crafting and enforcing a social media policy, understanding compliance and regulatory concerns, and engaging with common sense and considerate behavior. “100 Tips for Social Media Success” is available on the ShoeFitts Marketing website. ShoeFitts Marketing is a Portland, Oregon-based company specializing in marketing strategy and social media development for the retirement plan industry. The company’s approach is simple: use the right tool for the right job. ShoeFitts knows how to work within the parameters of the regulated environment from decades of experience working in the financial services marketplace. The company has galvanized industry marketing and social media efforts by developing a cache of premium products and customized training sessions, and using progressive strategies to provide fresh opportunities for clients to establish standout roles in their industry. Your KLT Factor: How do you Garner Trust? Trust. Objectivity. Transparency. How many times a day do you see at least one of those words show up in brochures, organization descriptions, and various marketing materials? More importantly, how often do these words seem to ring hollow? https://sherifitts.com/wp-content/uploads/2017/12/sheri-hdr-logo.png 0 0 Sheri Fitts https://sherifitts.com/wp-content/uploads/2017/12/sheri-hdr-logo.png Sheri Fitts2014-07-28 09:56:352015-10-19 14:06:49Your KLT Factor: How do you Garner Trust? The Tour De France is finally done! I loved it. It regularly amazes me that these cyclists ride what equates to a marathon each day for 21 days! Of course the marketer in me also marvels at the clarity of the target audience: a 30-something male who likes bikes and beer. While I don’t fit this ideal viewer, I do appreciate the show’s purposeful positioning and clear marketing perspective. Your KLT Factor: Social Media and Likeability is about Giving, Not Getting! With many aspects of marketing you ask yourself “what is my ROI?” Just as with other key business decisions, you weigh your time, effort, and investment against potential gains. However, there are always exceptions. One big rule-breaker is social media, where the objective is nearly all about the give. Indeed, My Golden Rule for Social Media is: 92 percent give and 8 percent get. https://sherifitts.com/wp-content/uploads/2017/12/sheri-hdr-logo.png 0 0 Sheri Fitts https://sherifitts.com/wp-content/uploads/2017/12/sheri-hdr-logo.png Sheri Fitts2014-07-28 09:42:122014-10-13 09:51:33Your KLT Factor: Social Media and Likeability is about Giving, Not Getting! At the recent National Speaker’s Association annual conference I was wowed by fabulous speakers, wonderful conversations, and useful tidbits I plan to incorporate into ShoeFitts Marketing and my speaking gigs. The event even included a great evening of dancing, which of course provided me with an excuse to wear my cowboy boots! I’ll share a few of those tidbits over the next few weeks, but if you must have some ideas now, my friend Don Cooper published this great article, 14 Sales Tips from NSA 14. Following a recent Florida speaking gig, I flew home next to a retiree, and with limited computer battery life took the opportunity to ask him about his former career and present retirement lifestyle.